Our Customer, Tipi S.A., is a Swiss-based IT company that connects local businesses and consumers through their online buying platform. To improve their service quality and increase customer loyalty, the company decided to go for mobile coupon app development and launch an iOS application that would complement their web portal. The Customer’s idea was to provide potential buyers with a centralized source of information on deals and coupons available in their location. The final solution had to become mobile-friendly, thus ensuring similar user experience whether end users surf the portal on their PCs or mobile devices. Delivered by Iflexion’s iOS developers, the solution combines the existing website’s business logic with social networking and geolocation features. To ensure successful promotions and sales information exchange between the mobile and web parts, Iflexion connected the application to a remote web server. Nearby stores and events. Once in the app, users can check in and receive invitations to marketplaces and events located nearby. The built-in GPS module determines a user’s current location and links it to a particular item (a store, a discount center, a supermarket, etc.) registered within the application. When users find a suitable coupon or a sale, for example, they can add comments and share their impressions on the selected promo campaign or event. User search. The application identifies and highlights individuals and groups who indicated their interest in certain promotional events and discounts. Based on this data, the application offers users to get connected with other app subscribers with the same buying interests or locations. Sales location search. The team enriched the deals app with additional search by location to enable users to buy necessary goods within a specific area. The search helps users save their time on finding the most relevant offering while increasing the chances of a purchase. Moreover, it encourages people to discover new places and find even more attractive offerings. Tracking friends’ statuses in the network. While marking out their buying preferences and making their purchases, users can also follow their friends’ activities such as reviews, stores ranking, selected sales, and events. This helps users understand quicker whether they want to take part in particular promo campaigns. At the final stage of the deals app development, the Customer requested additional changes in the app’s interface. However, some requirements didn’t meet the established iOS design guidelines. Iflexion’s team revamped a number of the application interface elements so that they offer a more user-friendly and compelling experience while complying with the App Store requirements for iOS-based applications. Iflexion’s developers used UIKit as a basis for the mobile application presentation layer. The business logic layer was built with JSON protocol in order to ensure correct data extraction from the server side. The team leveraged Google Location API to develop and integrate location-aware features. Facebook and Twitter API were implemented to enable users to post comments on social networks. Applying their expertise in mobile development and, particularly, in sale app development, Iflexion delivered a powerful iOS-based application that complements the existing deals web service. The team helped the Customer extend their customer reach, along with retaining the brand’s service level. As a result, all the involved parties can now enjoy the benefits of the mobile-enabled purchases and collaboration. Application users. Tipiness offers their users a great opportunity to find real-time information on best deals, bargains, and offerings on local products and services right on the go. Tipi S.A. While the Tipiness customer base keeps growing steadily, more shops and stores turn to our Customer to join their partnership program. 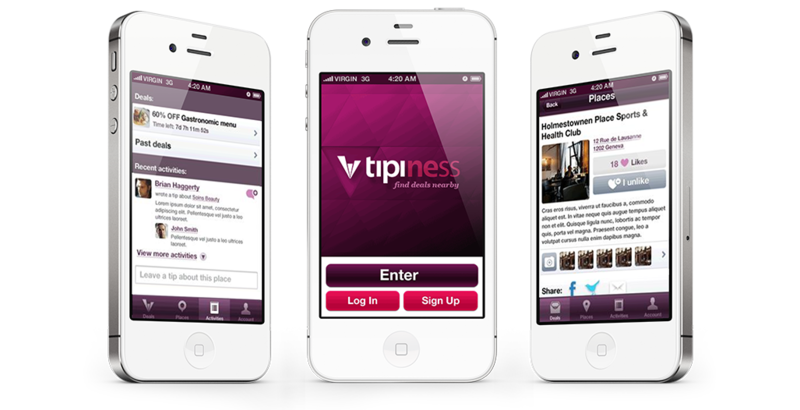 As Tipi’s partner network grows, users get more opportunities to benefit from discounts and online coupons. Local companies. Using the opportunity to promote their offerings among target consumers, businesses can achieve a significant lift in sales, while gaining a greater brand popularity and customer loyalty, as well as attracting wider audiences to particular promotions.